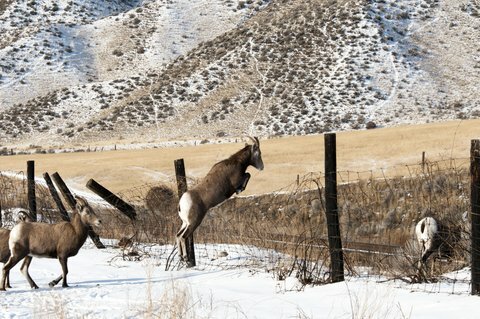 Two men out poaching bighorn sheep in the Columbia River Gorge in Oregon were busted when travelers along Interstate 84, the scenic highway that runs along the river, spotted them and called law enforcement officials. Cody J. Plagman, 37, of Albany, Oregon, was arrested Sunday after he and an accomplice were discovered near a pair of the animals that had been decapitated, according to KGW news in Portland. Plagman and another man, Justin Samora, 32, of Utah, had allegedly hunted and killed the two sheep without a permit, and were planning on leaving with the animal’s heads, according to Oregon State Police Lieutenant Bill Fugate. The sheep are protected by law, and so only a small amount are allowed to be harvested each year. When OSP troopers found Plagman, he was hiding near railroad tracks about two miles away. Both he and Samora were arrested and charged with taking or possessing a Bighorn sheep, wasting of a game animal and hunting on another’s cultivated or enclosed land.